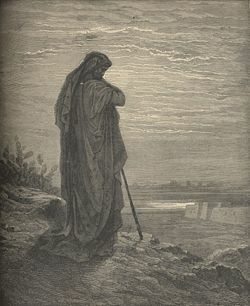 Amos (Hebrew: עָמוֹס—"Burden"—apparently a shortened form of Amasiah, meaning "the Lord carries") is one of the 12 minor prophets in the Hebrew Bible, whose speeches are reported in the Book of Amos. Amos prophesied in the days of Jeroboam II (793-753 B.C.E.) of Israel, while Uzziah (792-740 B.C.E.) was king of Judah. He likely performed most of his prophetic work c. 765-755. He was born in Tekoa, a town in Judah about six miles south of Bethlehem and 11 miles from Jerusalem in the territory of the tribe of Asher. Although a native of the southern Kingdom of Judah, he was called to prophesy in the northern Kingdom of Israel, especially in Bethel, one of Israel's ancient consecrated places (another being Gilgal) where sacred objects were kept and where the upper classes worshiped. Amos is not seen as a "professional" prophet, in contrast to many other Old Testament prophets such as Samuel, Elijah, and Elisha. Amos had three occupations before Yahweh called him to be a prophet, as a shepherd, a herdsman of cattle, and a tender of sycamore-fig trees (7:14). However, since it is clear from his particularly expressive, vivid, and forceful language and style of his writing that he was well educated, it is suggested that he was most probably from a wealthy background, and thus the owner of flocks, herds and sycamore groves rather than simply a herdsman or a farmhand. Sycamore-fig trees grew at a lower altitude than Tekoa, so Amos undoubtedly had to do some traveling to lower altitudes to tend these trees. This was the wild fig (siq-mim in Hebrew) which exuded a ball of sap when nipped at the right season, and which hardened into a sort of edible fruit which the lower classes were able to afford. Amos also probably would have done a large amount of traveling to the wool and cattle markets of Israel and Judah. Thus he became aware of the social, and economic conditions and practices of both the higher and lower classes of society, yet shaped by his rural experiences, maintained a clear perspective of the evils that he saw as he traveled. While the Israelites felt their lifestyle was normal, the prophet perceived it as hateful to God. The Book of Amos records that two years after Amos received the visions contained therein, an earthquake struck the area (1:1). Josephus, the first century CE Jewish historian, believed that the earthquake happened at the same time as Uzziah's seizure of the role of high priest and his subsequent bout with leprosy (2 Chr. 26:18-20). Archaeological findings unearthed at Hazor, about ten miles north of the sea of Galilee, show that an unusually strong earthquake occurred about 760 B.C.E. Amos was a contemporary of Isaiah, Micah and Hosea. Under Jeroboam II, the Kingdom of Israel reached the zenith of its prosperity and enjoyed a substantial period of peace and security marked by artistic and commercial development. Samaria, its capital, boasted of beautiful and substantial buildings of hewn stone and ivory decorations rather than brick. Abundance, comfort and luxury so abounded that northern Kingdom of Israel had attained a prosperity unprecedented since the time of Solomon. However, the division between rich and poor increased and social corruption and the oppression of the poor and helpless were common. In addition, although there was a great outward show of religious observance, including sacrifices and offerings, the priesthood had been defiled by appointment of non-Levites, many new holidays were celebrated that had their origins in pagan tradition, and even certain idols were kept in the places of worship. Amos was called from his rural home to remind the rich and powerful of God's requirement for justice (e.g. 2:6-16). He claimed that religion that is not accompanied by right action is anathema to God (5:21ff. ), and prophesied that the Kingdom of Israel would be destroyed (e.g. 5:1-2; 8:2). Amos' message was, perhaps understandably, unwelcome in Israel. Not only was he a foreigner from the southern kingdom, but his prophecies of doom were completely at odds with the prevailing political climate of hope and prosperity. Israel under the leadership of Jeroboam II had extended its territory into modern day Syria, taking advantage of the nation's weakness after a recent defeat by the Assyrians. Assyria, the major threat to Israel's power, had withdrawn itself temporarily due to internal strife, allowing Israel to flourish politically and economically. The nation's resultant affluence, however, was the main focus of Amos' mission as a prophet, and soon after Jeroboam (who for 12 years had served as co-regent with his father Jehoash), came to sole power in 781 B.C.E., Amos was called to speak to the people of the Northern Kingdom. Amos was continually in conflict with the governing authorities, as demonstrated in the narrative by way of a conversation between Amos and Amaziah, a priest of Bethel. The priest, loyal to Jeroboam, accused Amos of stirring up trouble and conspiring against the king, and commands him to stop prophesying. Amos responded with an oracle: “Your wife will become a prostitute in the city, and your sons and daughters will fall by the sword. Your land will be measured and divided up, and you yourself will die in a pagan country. And Israel will certainly go into exile, away from their native land." (7:17) While some have held that Amaziah eventually had Amos killed, there is no biblical evidence of his martyrdom. One of Amos' well known claims is, "I was neither a prophet nor a prophet’s son, but I was a shepherd, and I also took care of sycamore-fig trees.'" (7:14) While this was often understood to mean that Amos was reluctant to prophesy or that he was poor, scholars today see it as a claim to be financially independent and not a part of the corrupt religious system of his day. His agricultural holdings as a shepherd and a tender of trees were seen in his day as s sign of means, which he used to point out that he was not in the prophetic ministry for money, and that his efforts were only in response to God's command. even for four, I will not turn back [my wrath]. Amos uses simple language, being straightforward and direct with his messages from God, not only for Israel and Judah, but also for the surrounding nations. However, the style and organization of his writings reveals literary excellence. It is likely that Amos or one of his followers compiled and carefully organized his writings after he had finished his ministry in Israel and returned to Judah. Probably, the prophesies were not delivered orally exactly as recorded, as many of the topics are given poetic flair. The prophesies are meant to be read as a unit, but are not necessarily in the chronological order of his spoken messages. He may have repeated them on many occasions to reach as many people as possible. Amos is one of the first of the prophetic messengers whose words were preserved in permanent book form that would accompany Israel through the coming captivity and beyond. As recorded prophesy, the writings of Amos undoubtedly affected later prophets especially as predictors of doom and in their hostile attitude toward Canaanite influences in both religion and culture. It was one of the works used by Ezra to accompany the Torah and later become part of the canon of the Hebrew Bible. "We are going to work with determination to achieve justice on the buses. We are not wrong in what we are doing." [Shouts, cheering]. "We are determined here in Montgomery to fight until justice runs down like water, and righteousness like a mighty stream." Rabbi Abraham Joshua Heschel, who marched with Dr. King from Montgomery to Selma, has explained that the prophet emphasized for the first time in history the linkage between faith on the one hand and ethics on the other, that one cannot be truly a person of faith if he/she isn’t also moral and concerned for the well-being of all God’s creation. A 2006 campaign by the NAACP for a "living wage" was entitled "Let Justice Roll," an overt reference to Amos 5:24. ↑ A third important shrine was established at Dan by Jeroboam I. Other shrines are also mentioned in the biblical texts. ↑ The source of the tradition regarding Amos' martyrdom is the apocryphal Lives of the Prophets, a work from the second century C.E. ↑ It is interesting to note, however, that in his denunciation of the corruption of Bethel, Amos does not mention the golden calf icons that the author of the Books of Kings found so abhorrent. Gigot, F.E.. Amos. The Catholic Encyclopedia Vol. 1. New York: Robert Appleton Company, 1907. newadvent.org. Retrieved December 17, 2018. Calvin's Commentary on Amos. www.ccel.org. This page was last modified on 17 December 2018, at 21:12.